How is sense of fear and uncertainty created by the settings of The Red Room and The Yellow Wallpaper? ‘The Red Room’ by H.G. Wells and ‘The Yellow Wallpaper’ by Charlotte Perkins Gilman are both horror stories and they explore ideas of fear and the uncertainty that prey on the human mind. ‘The Red Room’ is about a young man who goes to stay in the Red Room in the castle. He is doubtful that the room is haunted when three old people warn him; however when he stays in the room for a couple of hours the fear of the unknown starts to play on his mind. 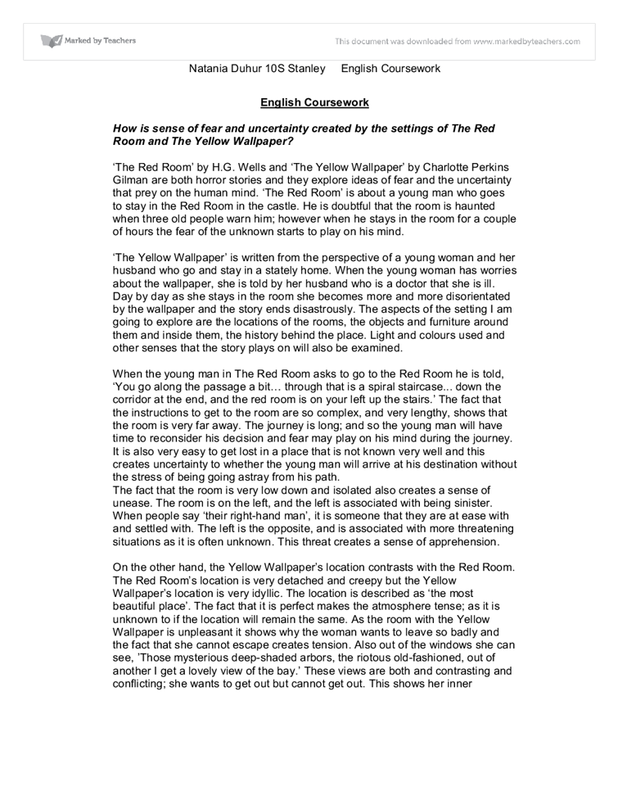 ‘The Yellow Wallpaper’ is written from the perspective of a young woman and her husband who go and stay in a stately home. When the young woman has worries about the wallpaper, she is told by her husband who is a doctor that she is ill. Day by day as she stays in the room she becomes more and more disorientated by the wallpaper and the story ends disastrously. The aspects of the setting I am going to explore are the locations of the rooms, the objects and furniture around them and inside them, the history behind the place. Light and colours used and other senses that the story plays on will also be examined. When the young man in The Red Room asks to go to the Red Room he is told, ‘You go along the passage a bit… through that is a spiral staircase... down the corridor at the end, and the red room is on your left up the stairs.’ The fact that the instructions to get to the room are so complex, and very lengthy, shows that the room is very far away. The journey is long; and so the young man will have time to reconsider his decision and fear may play on his mind during the journey. It is also very easy to get lost in a place that is not known very well and this creates uncertainty to whether the young man will arrive at his destination without the stress of being going astray from his path. The fact that the room is very low down and isolated also creates a sense of unease. The room is on the left, and the left is associated with being sinister. When people say ‘their right-hand man’, it is someone that they are at ease with and settled with. The left is the opposite, and is associated with more threatening situations as it is often unknown. This threat creates a sense of apprehension. On the other hand, the Yellow Wallpaper’s location contrasts with the Red Room. The Red Room’s location is very detached and creepy but the Yellow Wallpaper’s location is very idyllic. The location is described as ‘the most beautiful place’. The fact that it is perfect makes the atmosphere tense; as it is unknown to if the location will remain the same. As the room with the Yellow Wallpaper is unpleasant it shows why the woman wants to leave so badly and the fact that she cannot escape creates tension. Also out of the windows she can see, ’Those mysterious deep-shaded arbors, the riotous old-fashioned, out of another I get a lovely view of the bay.’ These views are both and contrasting and conflicting; she wants to get out but cannot get out. This shows her inner confusion- she is unsure of her surroundings and this supports the atmosphere of vagueness. So the Red Room and the Yellow Wallpaper both contrast in using the location to achieve a sense of fear. The furniture and objects in the room also depict an unnerving and tense atmosphere. For example, Wells uses phrases such as,’ whatever dust had gathered on the carpets’. Dust symbolizes and old or antique quality in something, or something that has aged. The fact that the carpets are described as old and the castle itself is described as ‘deep-tone and old fashioned,’ magnifies the fact that it is unknown to how long the furniture has been there, why it there and this creates great insecurity. Objects in particular create a sense of unease. ‘The porcelain Chinaman whose head rocked silently.’ Wells has used personification and by making the inanimate object life-like, this highlights the idea of unease. The porcelain Chinaman’s ‘nodding’ is like an acknowledgement of the young man’s presence in the room. The fact that he does not know if it is knows preoccupies the young man and this generates feeling of great insecurity. The people in the castle also add to the atmosphere. ‘The man with the withered arm….’. It is unknown to the young man what has happened to this unfortunate man, questions about the man and his involvement with the Red Room will be on the young man’s mind. This reinforces the sense of intrigue, but apprehensive intrigue. If anything goes wrong whilst the young man is in the Red Room, this amputee will not be able to help him at all. In the Yellow Wallpaper, the sense of anxiety and panic created by the furniture and objects contained in the room are similar. ‘The windows are barred for little children and there are rings and things on the walls.’ This supports ideas of imprisonment and restraint. There is an amount of uncertainty to whether it is possible to leave the room, and this creates a disturbing atmosphere. Gilman also uses the technique of personification similar to that of Wells, and she as describes the wallpaper this emphasizes the sense of doubt. ‘I get positively angry with the impertinence of it,’ highlights the idea that the wallpaper which is usually a lifeless objects moves and has a life of its own. The fact that she is angry towards the wallpaper shows that she is losing tough with reality and this is a slightly more alarming statement- she is going crazy over moving wallpaper, and this makes the room seem sinister. Another aspect of the setting I will explore is the history of the room and how it creates a tense atmosphere. The objects in the room are described as foreign. ’The ornaments and the conveniences of the room were not of this world.’ This old furniture takes the young man back to when it was the norm to believe in hosts and because the room contains these things it is easier for the young man to imagination to run away and for him to start trust that he is seeing the paranormal. The actual story behind the Red Room, which the young man remembers as he opens the door,’ the great red room of Lorraine Castle, in which the young duke had died.’ He remembers it just as he enters the room, which shows that the fear of what may happen to him is playing on his mind. This creates a sinister atmosphere. 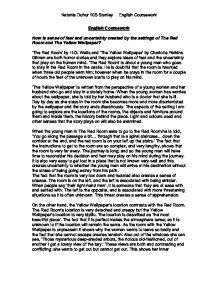 The Yellow Wallpaper contrasts with the story in the Red Room as the story to the Yellow Wallpaper is left unresolved. Several places in text suggest that there has been someone in the room before and they have experienced similar things whilst lodging in the room. ‘It is stripped off- the paper- in great patches all around the head of my bed.’ This suggests that the areas of the wallpaper have been taken off by someone else in act of aggression or tearing at whilst tied to the bed. Another piece of text that magnifies this idea is, ’Then the floor is scratched and gouged and splintered, the plaster itself is dug out here.’ This also suggests that this is an act of desperation: gouged has a very ominous tone and this history of attempts to escape from the room creates a very sinister tone but the unknown outcome of these situations highlight the uncertainty. Light and Colour in the Red Room also create a sense of fear and uncertainty. The name of the room, ’the red room’, suggests that the room has associations of blood, passion and anger. Phrases such ‘shadows cower and quiver,’ also conjure up a scary atmosphere. The shadow has been personified and this makes him seem as if he is not alone. Quivering is a small but very fast movement, very oxymoron and this associated with anxiety, and this makes the mood seem anxious. ‘Picked out everything in vivid black shadow and silvery illumination.’ Everything is ‘picked out’ or highlighted and so it is noted. Black creates a sense hesitation and darkness so you cannot see the unknown. The silver comes from the moon and this creates a mysterious tone or the sense of the supernatural very strong. In the story of The Yellow Wallpaper, the use of light and colour are used to describe the wallpaper,’ So I kept still and watched the moonlight on that undulating wallpaper until I felt creepy.’ This suggests the wallpaper is moving and the moonlight gives the sense of the supernatural. The use of the moon is apparent in both texts and this makes them similar. ‘A smoulder unclean yellow, strangely faded by the yellow by the slow turning sunlight.’ Smoulder means smoky, and when there is smoke it makes something unclear. This supports the idea of uncertainty. This idea of smoke taints yellow, which is naturally a bright, conspicuous colour, normally associated with vivid, cheerful things. This makes the colour seem unnatural and quite unsettling. The colour emphasizes the fact that the wallpaper and its properties are unnatural, and the unnatural is uncomfortable and therefore intimidating. The displacements of light and colour used in both stories are therefore similar. Other senses used in the Red Room are sound and touch. ‘A rustling, I fancied, I heard,’ the narrator is unsure of whether or not he has heard the sound and where it has come from. This ambiguity plays on the brain, and makes the narrator frightened. ‘And the door creaked on its hinges,’ also plays on the senses. Creaking makes people feel tense, especially if they cannot see what is causing the creaking. Echoes also play on the hearing sense. ‘ The echoes rang up and down the staircase.’ This reinforces the fact that the sounds play on the senses as they are everywhere, and ringing makes the room seem empty and hollow. Touch or temperature is also used,’ The long, draughty subterranean passage was chilly and dusty.’ Draughty suggests the cold, and it is a frequent belief that rooms go cold as ghosts enter them. The cold also makes you shiver, and so can fear. The fact that it is subterranean which is under the earth suggests claustrophobia, and being enclosed is a very frightening thought. In the Yellow Wallpaper, the other sense that the wallpaper plays on is smell. The smell of the wallpaper is described as, ’A peculiar odour,’ and ‘A yellow smell,’ these create a sense of fear, as the smell is not a recognisable smell. Smell is a very powerful sense, and when an unpleasant smell is in the room, you cannot close your nostrils like you can close your eyes or put your fingers in your ears. In a way, you cannot escape smells because they are just there and they cause the fear. Echoes and temperature however can be escaped as it is imagination that creates the fear. In this way, The Yellow Wallpaper and The Red Room contrast. In conclusion, the most significant similarities are the use of light and colour. Even though the colours of the objects are not the same, they both create and reflect the emotions of uncertainty and fear in the characters. The use of light or the non-existence of light in some cases also highlights the fear of the unknown by the two characters. The most significant differences are the other senses both stories play on. Smell is a very limited sense, whilst hearing and touching can lead to a lot of ambiguity and the mind often playing tricks on itself. Therefore these are the most significant and differences between the two stories. How does H.G Wells create, maintain and release tension in The Red Room? White enquired Morris what he had to do when he wanted to wish for something, 'Hold it up in you're hand and wish aloud.' This quote creates suspense because it makes the reader think, is the wish going to be granted straight away or soon after a while? Jagged peaks and velvety moss green suggest an untouched side of China that has not been affected by commercialism; also emerald is a very precise use of colour. Amy Tan uses exact details to establish the correct image in the mind of the reader. of the narrator has changed, bringing up the suspense of what actually happened to him. From this the narrator gives a short answer ' "Yes" said I; "the room is haunted" ' this is an essential technique as it reveals more anticipation and suspense, we want to know what haunts the room. This affects the language because the darkness does not "germinate" and only seeds do this when they are changing into a plant. The author is describing the darkness and developing like a seed and growing. Isolation is used in "The Monkey's Paw" because in the text it says "that's the worst out of living so far out". family and friends because they expected her to be distraught therefore she couldn't think about the life ahead of her. The narrator tells the reader exactly how Mrs Mallard is feeling and what she is thinking so we are able to get inside her thoughts.